56 days on the road. To avoid the cabin fever that was starting to set in from too many consecutive rainy days, we geared up for a change in scenery. The site of the ocean always feels like a fresh breath of air, renewing our sense of wanderlust. Reminding us that this wandering life is good. We decided to take a family day trip for a taste of Oregon ocean air. Before the light began to sparkle through the trees, the Husband slipped out the driver’s side door with a flashlight. He unplugged our electricity and shoved the extension cord in the back of the van. Slowly, over bumpy road, we creeped out of our forest campsite to snag a beach front spot. Not even 6am, and one spot left. Turning off the engine, the temperature quickly drops inside the van. The Husband throws a small chunk of a duraflame log into our mini fireplace, and lights a match. Within the minute, it’s warm and cozy again, just like we never left. Waves crash just outside our door. Letting us know there’s fun to be had, whenever we decide to come out and play. A touch of sun starts to melt the chill in this salted air, and we decide to step outside. 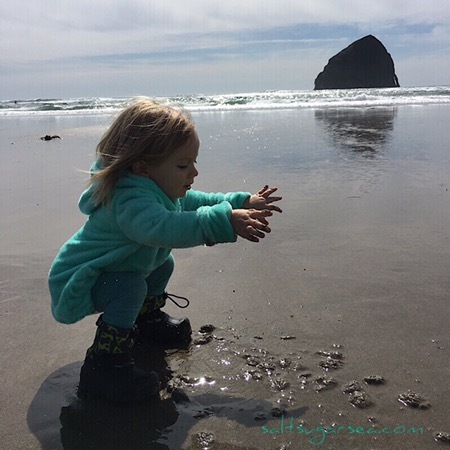 Cape Kiwanda’s empty beach runs as far as you can see, and Baby happily explores the new elements. 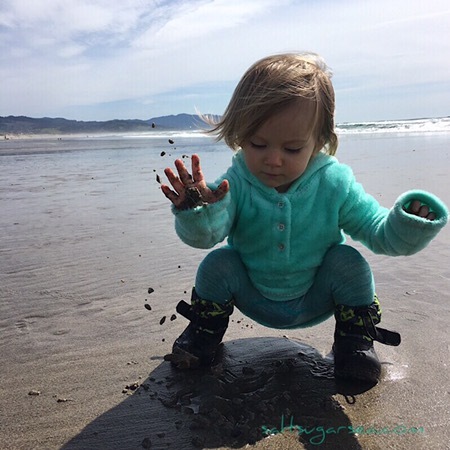 Chucking wet sand into the air is her favorite game for the day. 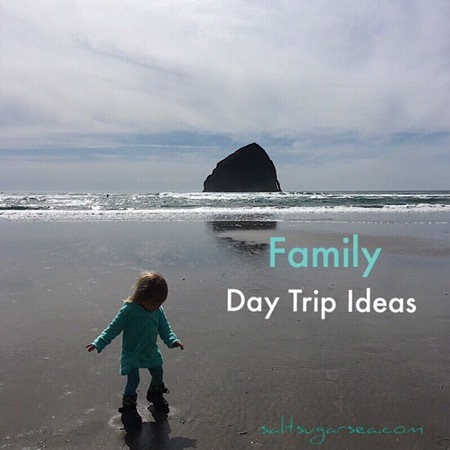 A family day trip can be as simple as a change of scenery. What are your favorite Beaches to explore? What are your kids favorite beach games? Share with us in the comments!